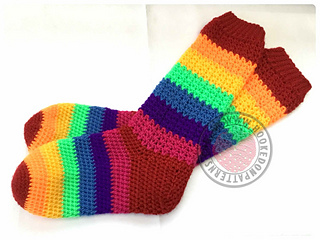 Crochet these comfy slouchy socks to brighten up your day. Written in US terms with a conversion chart included for UK terms. Photographs have been used throughout to help with clear instructions. A printer friendly version will also be included. I have used DK yarn with a 4mm hook. 2” square = 10 hdc x 9 rows working in between stitches as per the pattern instructions. You may use any type of yarn you prefer, I have used Acrylic yarn. 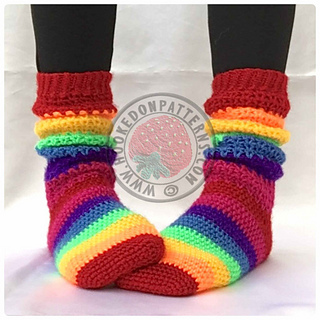 The pattern will give you colour changes to make the rainbow coloured socks pictured. 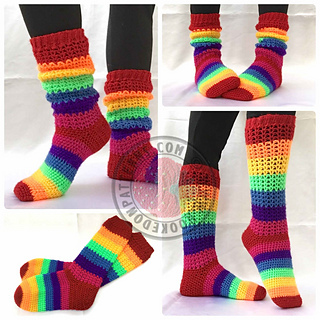 You can make these in any colour or colours you choose instead. DK yarn in Red, Orange, Yellow, Green, Blue, Purple, Pink- Less than 50g of each used. 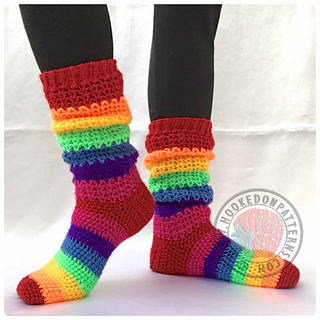 Or approximately 150g of any colour. 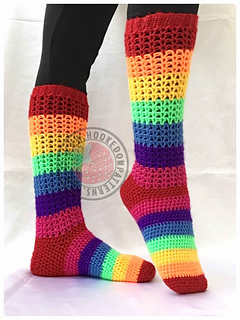 4mm crochet hook or size needed to achieve correct gauge.